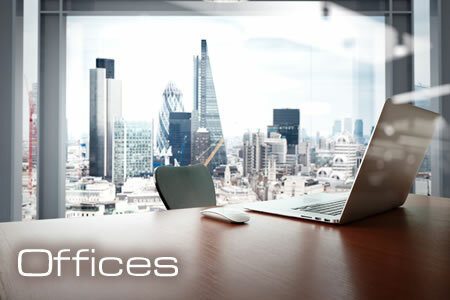 The necessity for sprinklers in office’s is generally a requirement by the AHJ, building control or Insurer. Office areas are generally sprinklered using the BS EN 12845 standard, with offices categorized as OH1. The installation of fire sprinklers can also bring significant benefits in respect of compliance with Approved document B. For example the presence of sprinklers allows for a more open plan office design. Recent research from BRE Global shows that insurance is not enough to fully protect companies from the long-term impacts of fire. Uninsured risks, such as business interruption and damaged customer relationships can cause lasting harm to businesses. Triangle Fire Systems design, supply, install, test and commission commercial fire sprinkler systems in accordance with BS EN 12845. Our accreditation enables us to install commercial and industrial sprinkler systems for pre calculated contracts with water supplies, equivalent to LPCB Level 2.